SENIOR lawyer Thio Su Mien on Thursday revealed the key role she played in bringing about the change of leadership at the Association of Women for Action and Research (Aware). Appearing at a press conference called at short notice by some of the association’s new leaders, she said she was alarmed to discover that Aware had lost sight of its original purpose and become pro-lesbian and pro-homosexual. 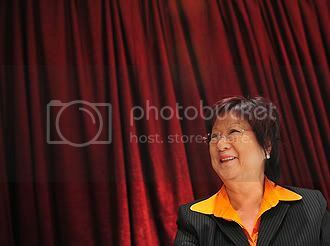 Dr Thio, 71, a born-again Christian who runs her own law firm, is the mother of Nominated Member of Parliament Thio Li-ann and her nephew, Dr Alan Chin, is married to new Aware president Josie Lau. She was the first woman dean of the Law Faculty at the then-University of Singapore, from 1969 to 1971. Introducing herself as a ‘feminist mentor’ to working women, she said she began monitoring Aware’s affairs about a year ago. Disturbed by what she saw as signs that it was promoting lesbianism and homosexuality, she began urging women she knew to challenge Aware’s attempts to redefine marriage and families. On Thursday, the new Aware leaders said that they and their families had been threatened and even received death threats, and they have reported them to the police. She said she had been teaching and counselling some of them in different groups for up to 10 years. She was ‘absolutely outraged’ that a group of women who just wanted to contribute to society are now facing ‘ferocious attacks’. ‘I don’t understand what has become of our people,’ she added. THIO Su Mien explained that her concern about the direction that Aware was taking was partly prompted by a letter from a parent who was concerned that the society was promoting a homosexual agenda. She wrote to the Today newspaper in 2007 to ask why Aware’s choice of a movie for a charity show was Spider Lilies, about two lesbians who fall in love. Dr Thio said she went on to discover that in Aware’s comprehensive sexuality education programme, which is taken to schools, homosexuality is regarded as a neutral word, not a negative word. ‘I started thinking, ‘Hey, parents, you better know what’s happening,” she said. ‘What is happening in society is that we are redefining marriage, we are redefining families,’ she said. Pointing out that Aware’s programme was already in 30 schools, she said: ‘The suggestion is that in this programme, young girls from 12 to 18 are taught that it’s okay to experiment with each other. Insisting that she was not anti-homosexual, she said: ‘I have nothing against lesbians or homosexuals personally. On a personal front, I’ve ministered, I’ve counselled them. ‘They are in pain. And very often from families where you have abusive fathers, they do things with their daughters and the daughters revolt, rebel against society. Dr Thio said that Aware was formed 26 years ago by her contemporaries and friends, and had done great work in many areas. But she noted that its membership had dropped from about 700 in 1998 to around 200 in 2006. She was dismayed that at the annual general meeting in 2008, there was a move to give men the right to vote ‘in a women’s organisation where the objective is to represent all the women of Singapore’. Only 25 people attended that AGM. The motion was defeated, but reappeared on the agenda at the AGM last month. She then started looking into the affairs of Aware to see what was going on at the organisation set up by her friends. She said that there were many women’s issues that needed to be looked into, and cited the need to ensure that retrenched women are dealt with fairly. ‘I find to my dismay that Aware seems to be only very interested in lesbianism and the advancement of homosexuality, which is a man’s issue,’ she said. She felt this matter had to be discussed, but Aware should focus on going back to look after all women in Singapore. ‘Can we re-focus on the excellent objectives of Aware? Go back to its original purpose for it being an NGO?’ she asked. Aware’s membership numbers have swelled so much in the run-up to its extraordinary general meeting on May 2 that the women’s advocacy group has to find a new venue to hold it. “As of Wednesday, our membership has gone up to 880 (and) the place we have booked doesn’t seem big enough,” said honorary treasurer Maureen Ong. Aware membership stood at 400 last week. The meeting, which is supposed to address the rift between the old guard and the new leadership, will nevertheless go ahead as scheduled, she confirmed. Plans are under way to look for an alternative venue.